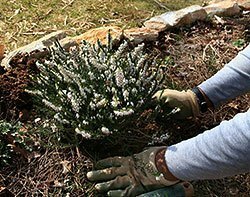 There’s more to planting perennials than just popping plants out of their pots and plopping them into the ground. Before planting, prepare your soil by working in soil amendments like compost or well-rotted manure to ensure success. Work out your planting layout by using the height and spread information on plant tags to decide how far apart to plant. A plant that grows 24 inches (60 cm) wide should be planted so it has 24 inches (60 cm) to spread. Place taller plants behind the shorter ones. The best time to plant annuals and perennials isn’t a hot, sunny day but a cooler, cloudier one — such conditions are less stressful for the plants, and the gardener. Give the planting area a good watering, preferably the day before so you don’t work in muck, or plant after rain has moistened soil. If perennials are dry in their pots, water them first to get them moist. Dig a hole that’s wider but not deeper than the container. Never shoehorn a plant into a hole that’s too small. When planting perennials, work with one plant at a time, so that tender root hairs aren’t exposed to drying air longer than necessary. Tap sides of container or squeeze pot to loosen plant, and turn upside down so plant slides out into your hand. Handle plants by their root mass, not stems; stems can easily be damaged. Inspect roots; if circling, gently tease apart or they will continue to make circling growth. If roots are difficult to loosen by hand, make four shallow cuts into root mass near the bottom with a sharp knife. This promotes growth into surrounding soil. If you see lots of potting mixture but few roots, work off some potting soil with your fingers to ensure plant roots will make physical contact with garden soil. Potting mix dries quicker than surrounding soil, making new plants susceptible to drying out. Set plant into hole; place exactly as deep as it was in container. Cover roots with loose soil, water lightly; add remaining soil and pack gently but firmly; never stomp on delicate roots. Water well. Do not apply water-soluble fertilizer when planting perennials, but wait about a week or so to allow roots to grow a bit. Organic fertilizers are the best choice because they support both root development and the soil-borne organisms that are beneficial to healthy root growth. Keep new perennials moist for a couple of months, but don’t kill with kindness: let top 2 or 3 inches (5 to 7 cm) of soil get a bit dry-looking between waterings.